Can has Dónal in side control. Normally his head would be down: he’s looking up for the camera! At Artemis BJJ, we believe the optimum way to learn is by focusing on specific positions for extended periods of time. That’s why each month, all lessons will cover the same position, enabling students to really concentrate on enhancing that aspect of their game. We’ll be looking at maintaining, escaping and attacking the position, through drills, specific sparring and multiple techniques. For our first official month of operation (we’ll include the last week of January, as we started on the 27th), that position will be side control. BJJ terminology is not standardised, so this has a few other names. The most common alternatives are ‘side mount’ and ‘cross side’: for a listing of some others, take a look at Can’s BJJ glossary. In jiu jitsu, you will find that – especially early on – you will spend a lot of time trying to escape from under side control, so it’s an essential skill to develop. Can covered one method last week and there will be further lessons on the topic as February progresses. That was the topic of our first lesson, where Dónal went over some excellent concepts to help you solidify your side control. We will of course also be investigating a few attacks from side control as well. Once you can maintain side control, it becomes a great platform from which to launch your offence. As always, Can will be writing up every class he attends over on his website. 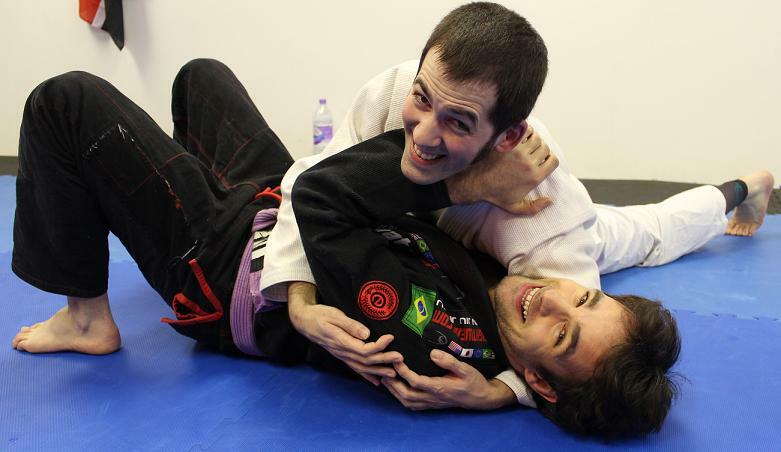 So far, you can read about the session Can taught on escapes here, while Dónal’s lesson about maintaining side control can be found here.